Based on the information provided by this page you will be able to implement face detection successfully with your C# camera application. As a first step, OZEKI Camera SDK has to be installed and a reference to OzekiSDK.dll has to be added to your Visual Studio project. 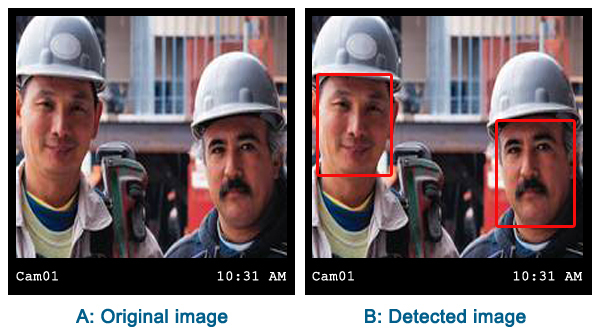 The face detection function is a new generation application which can make your business life a lot more easier. Face detection can be an effective help in national public environments and it speeds up the entry procedures. For example: if you wish to digitize the entry procedure of your employees you should use the face detection function of the Ozeki Camera SDK. When someone arrives, the face of the person will be analysed and detected. This way, you can use this function for security improvement. Some computer vision possibilities which are supplied by the SDK require an extra ToolKit. This ToolKit is the OzekiComputerVision.dll to which a reference has to be added in the project, just like in the case of the OzekiSDK.dll. This dll is responsible for the algorithms and tools which are necessary for the CV (Computer Vision) actions. For detecting faces we can use the IFaceDetector object of the Ozeki Camera SDK. After an instance has been created with the help of the static ImageProcesserFactory class we can detect on frames and on video as well. In the case of frames the output image can be created by the Process() method of the instance. In the case of videos we have to use the ImageProcesserHandler mediahandler. This is a mediahandler from a VideoHandler class (so it is VideoReceiver and VideoSender at the same time) which means that the input can be a VideoSender (for example WebCamera) and the output can also be created for a VideoReceiver. These connections can be achieved with the help of an instance of the MediaConnector class in the SDK. No actions are executed on the input frames they are simply forwarded by default. However, the object which implement the IImageProcesser interface (for example the IFaceDetector) can be added with the help of the AddProcesser() method. More instance can be added which implement IImageProcesser, they will run one after the other using the image which is before them in the list. The example uses the FrameCapture mediahandler as well which examines only every fifth frame. Make access to all avaiable cameras, which you can select from afterwards. Mediahandler which prepares the image which is sent by the mediahandlers from the VideoSender class for the VideoViewerWF instances. With the help of this lecture you can successfully implement face detection with your C# camera application using the Ozeki Camera SDK. After examining this article you will have the needed information to be able to benefit from the face detection function on different fields of analytics. Which OS are supported? Does it work with Windows 8? Yes,the SDK works with Windows 8. The following Operating Systems are supported:.